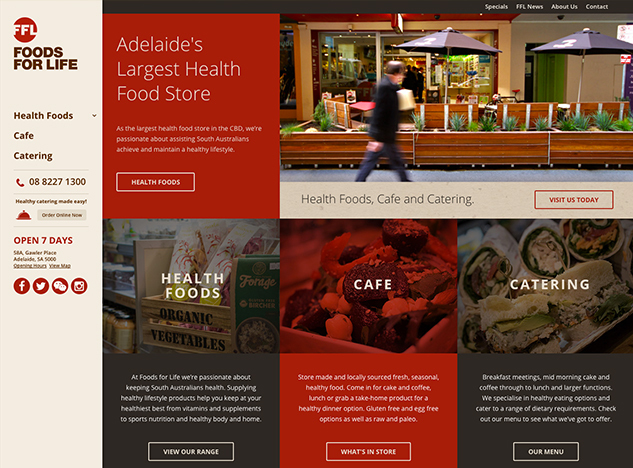 Foods for Life’s website has had a refresh! Our new site has been designed to help our customers better understand what we do, the products we offer, as well as provide a new, simple way to order catering online. Our range of health food, vitamin, sports nutrition, naturopathic, Chinese supplements and home & body lines provides our Adelaide CBD customers with a one stop shop for all their health needs. In addition, our cafe has a fantastic range of house-made wraps, salads, pies, pasties and sweet treats, and we also cater to specific dietary requirements offering a range of gluten free, dairy free, sugar free, vegetarian and vegan options. Check out our monthly specials and sign-up for our e-news to stay up to date on the latest offers in-store. So have a browse of our new site or stop by the store and visit our friendly, helpful and knowledgable staff – including our qualified naturopath and nutritionist.